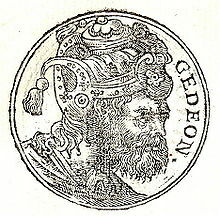 Gideon or Gedeon,[lower-alpha 1] an aw named Jerubbaal,[lower-alpha 2] an Jerubbesheth, wis a militar leader, juidge an prophet that's cryin an veectory ower the Midianites are recoontit in chaipters 6 tae 8 o the Beuk o Juidges in the Ebreu Bible. ↑ For the form Jerubbesheth, see Thomas Kelly Cheyne (1901) . "Jerubbesheth". In T. K. Cheyne; J. Sutherland Black. Encyclopaedia Biblica: A Critical Dictionary of the Literary, Political, and Religious History, the Archaeology, Geography, and Natural History of the Bible. 2, E-K. New York: The Macmillan Company. This page wis last eeditit on 3 November 2018, at 04:32.